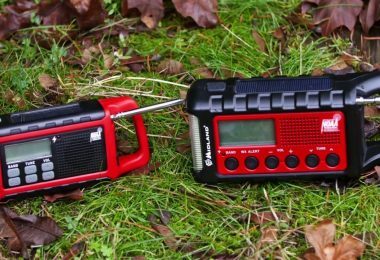 When it comes to getting to the great outdoors you don’t want to be fumbling around with all your supplies. 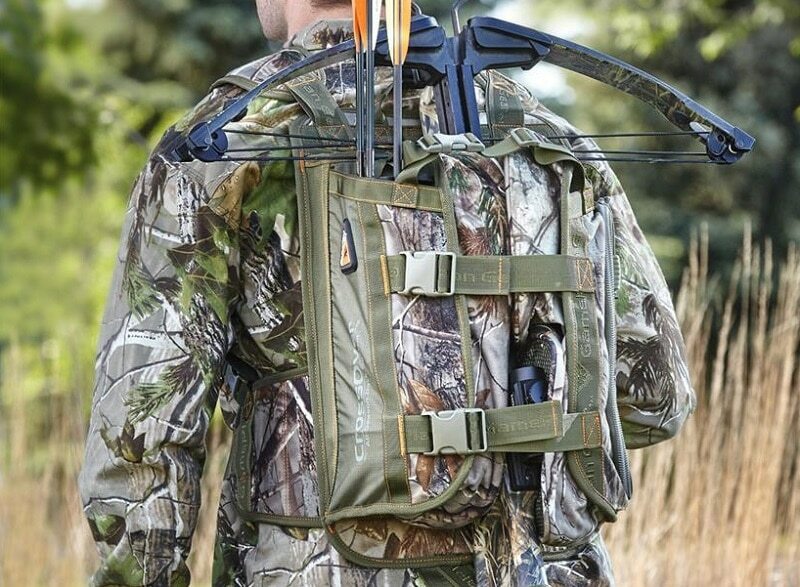 Having a bow hunting backpack is a sure-fire way to stay organized, keep quiet in your hunting atmosphere, and still take along all of your necessary gear. Most hunters will tell you that if you are on the move, chasing your game, regardless of what kind of weapon you carry, you want a pack that is designed to give you optimal flexibility and storage. In this article, we are going show you how to ditch the days of scrambling along with your gear flying about, and instead, pick the best bow hunting backpack. As your skills expand so will your gear, the longer you hunt the more technical your journey and therefore the more ‘what-if’ scenarios start cropping up. There are going to be quite a few features that you will want to look at before you jump straight into a purchase. Like all expeditions where you are carrying the essentials on your back, you want to make sure that you have a pack on that will not only accommodate your load but do so in a way that you won’t be pulling your back out. Some packs will expand, have hydration systems, hold your bow and a gun, and then they come in a range of sizes weights and frames. Don’t get too overwhelmed because we will break down the essentials to glance at, but regardless, the best backpack you can get is one that fits you and makes you the most comfortable. Each individual will have a different priority, whether it’s size or the amount of pockets, your priority will need to be what you look for in some of the fantastic backpacks we have below for you to choose from. There is nothing more important with a backpack that you fully intend to stuff full than how it feels once it’s on your body. The key to the right backpack fit falls not in your full height but rather just the length of your torso. Your torso, in backpack world, is considered to start at the bony bump at the base of your neck, a C7 vertebra for you doctors out there. To measure at home, place your hands on your hips, pointing your thumbs straight backward, and measure from the top bump down to the base of your hips, where your thumbs are pointing. If this sounds a bit complicated, or you don’t have a friend handy to help, stop into your local gear shop and ask for a backpack measurement! You are also going to want to know the size of your hips, or rather right above your hips. A good pack disperses weight off your shoulder and on top your hops, so make sure to measure the tops for the ideal hip belt size. Depending on where you wear your pants, this could be a different measurement from a normal pant size measurement. When you are out on the prowl looking for game, or testing out your new pack, stuffed full of your gear, you are going to want to make sure that you have plenty of belts and straps to adjust. The straps we list below are essentials in buying the right bag, as it will disperse the weight of your gear, give you more flexibility, and more balance in critical moments. Hip Belt: As we mentioned before, you are going to want a very adjustable hip belt for optimal movement. The majority of your weight load will be carried here, so you want to make sure it is padded and fits comfortably. 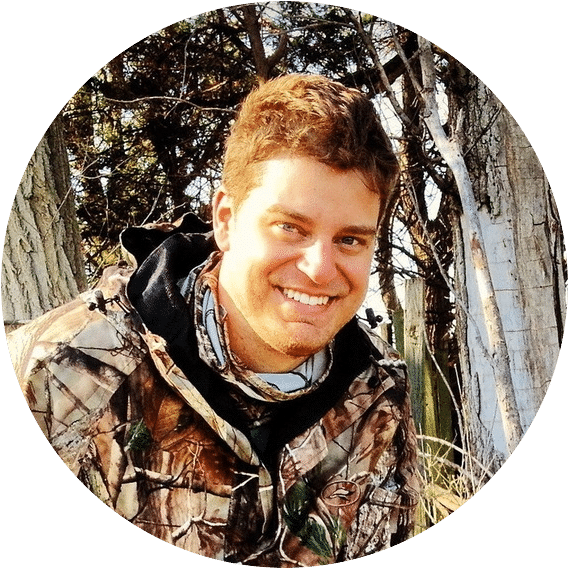 Your belt should be snug, but it shouldn’t be tight, and remember if you are into multi-season bow hunting then you want to make sure your pack will still fit comfortably even with three or four layers of gear on. Shoulder Straps: Why feel like you are carrying the weight of the world on your shoulders? If a shoulder strap is adjusted properly, and you have a good pack, then they will not be carrying a significant weight. As you go about your trek you will be using these straps to change the weight and relieve pressure off of certain parts of your body. Load Lifter Straps: The less common, but just as important strap is the load lifter which goes from the shoulder to the point at the top of the pack’s inner panel. It will angle your pack about 45 degrees off your body. If you put on a pack and start loading in gear only to notice that your shoulders constantly feel pinched, then it is because this strap is too tense. This strap will help keep you balanced and will ultimately save your shoulders and middle back. Sternum Strap: Finally, there is the sternum strap. It should be located an inch off the collar bones and buckled tightly enough that your arms can move but your shoulders feel supported. You will know pretty fast if you have done this wrong, as it will make it difficult to breathe or make your pack feel like it’s sliding backward. *A Back Saving Tip: Sometimes our packs feel great until we are about a mile into our trek, that is because as we hike things move around, our posture changes, or we need to better disperse weight. One thing to keep in mind is to take breaks if this is your first time carrying a heavy load. Even though it’s just idly on your back, your pack is working a lot of muscles! How big your backpack in will depend on what type of hunt you are going on and how much equipment you think you will need for a successful day. 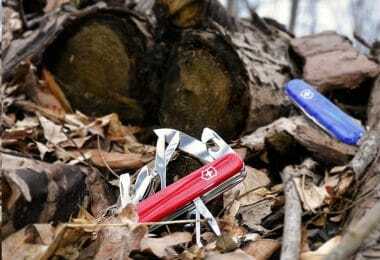 If you think of yourself as a minimalist remember you still need your bow hunting equipment, should bring along a multi-tool, some form of an extra lamp, and a GPS or cell phone device. Those items will probably not fit in your pockets so even a small pack will be helpful. If you are prone to bring every single thing along with you for safety, make sure that your pack can accommodate this, but try to remember you are only gone for the day! A built-in hydration system that allows for you to drink water quietly and efficiently while bow hunting. Plenty of outer pockets for easy access to gear, but also pockets on the interior so that you can organize your pack in a way that makes sense for your trip. A built-in or attachable rain cover, especially if you find yourself bow hunting in the fall and winter seasons, you don’t want your gear to get damaged as you trek about the forest. As mentioned before, adjustable straps to provide the perfect fit. Finally, make sure that the pack you are picking is built to be lightweight, on your day trip you do not want to carry extra weight that will slow you down and make your hunt unsuccessful. When picking a pack you are looking for maximum efficiency and space. 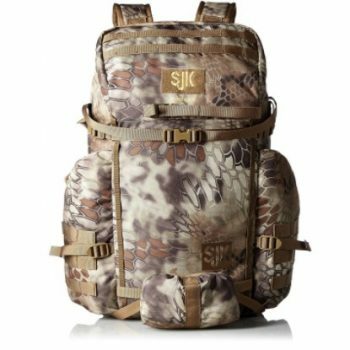 Pack your bag because you are ready to go out and find the best bow hunting backpack on the market. Below we have rated a few that will be great for your day trip, just keep in mind that at the end of the day it depends on you and the type of hunt you are going on. 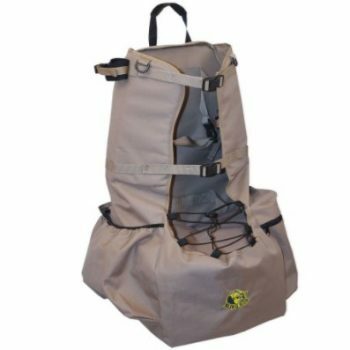 Specific Features: The Badlands Point Day Pack acts as a top loading pack, allowing gear to be crammed in the top without having to worry about zippers blowing out in the load bearing portion of the bag. Sheds, trophy racks, snow shovels or foam pads can also be attached behind the beavertail pocket. Best Use: Daypack for bow hunting. Description: This bag provides you with not only the space to store all your belongings but also outside straps for compressing it down. It is relatively lightweight, an excellent price and is modeled off traditional rucksack bag designs. Get the same feel as your old packs with new technology that keeps your gear in place and you on the trail. The top of the pack has a small storage area for quickly grabbing essential gear or storing a GPS. Not only will you be able to organize all your gear inside, but you can also enjoy the extra padding along the inside of the pack, and the rigid frame to give you extra support. If you are on the taller end of the scale with a long torso, be aware that the hip belt might ride a little high. Specific Features: Designed to be used as a shooters rest as well as a pack, this bag allows you to aim and fire a rifle without removing it from the pack. The pack also comes with straps to hold your crossbow, nine separate pockets, and a built-in rain cover. Your gear is going to be both accessible and dry. With specialized compression straps, your crossbow will stay in place even while you move swiftly through the forest. Best Use: Daypack for bow hunting, all seasons. 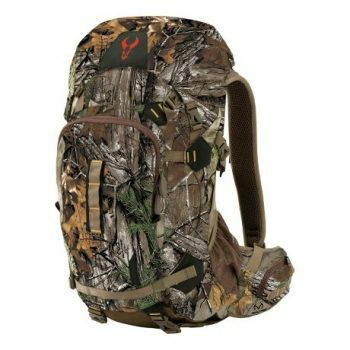 Description: Light and versatile this Tenzing TC SP14 Shooter’s Pack Hunting Backpack, Realtree Max Xtra offers a lot in terms of organization, light weight, and durability. Even on your most treacherous hikes, the extra padding along the hip belt will keep you comfortable. Designed specifically for hunters, you can be assured that the transition from wearing to shooting will be swift and comfortable. The extra adjustable straps allow for the weight to be distributed evenly, even with heavy bows on your back. Whether you are ducking into a bush or climbing into a tree this pack will allow you to have flexible and balanced movements. The only thing people want is a little more, the pack could be a bit bigger to extend the trips a little longer and pack spare clothing, and potentially some hip belt pockets for easier access. The capacity does lower once your bow is strapped in, and even though there are two side pockets, they are pretty narrow. Specific Features: Stay hydrated throughout the day with its very own water bladder, along with an insulated hose. The bladder will be able to hold approximately 2 L for a full day out on the trail. The Timber Hawk Killshot Backpack can carry a rifle, bow or tripod, and comes with shoulder straps specifically designed to adjust to your torso and padded waistband with maximum comfort. The pack also has quick-ejection clips for quickly dropping your pack, a pullout rain fly for extreme weather and a binocular strap. 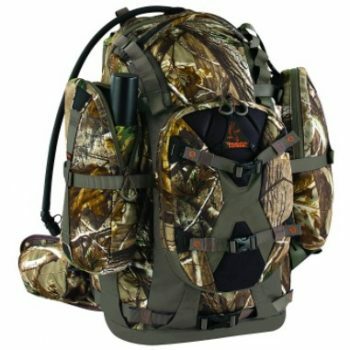 Description: This pack is a full-service backpack for the ultimate backcountry adventure hunter. You can enjoy all the accessory pockets, including one on your hip belt, and stay hydrated with your water system that allows you to sip without creating noise. The internal frame will offer you the support you need, and while the pack is heavier it can help you carry more. Reviewers rate this pack very well for its durability and comfort. This is one of our most highly rated packs, with the only downside being its weight when full, this is mainly due to the extended capacity and the addition of a water system that gives you up to 2 liters of water for you to stay hydrated. Specific Features: Spacious twin pockets for bipods, Optics and other gear. Compression systems, multi-weapon carry system to secure storage and keep the pack small even as you carry all your gear. The bag also offers single stay suspension, which is light while supporting your heavier loads. 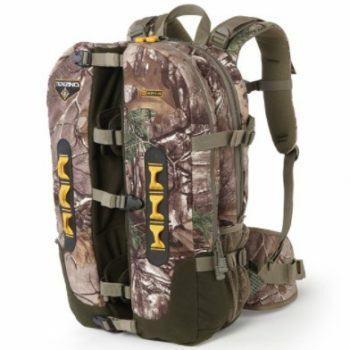 Best Use: Day backpack for bow hunting. Description: Enjoy the special pockets intentionally built in this pack for easy access and hydration, in each side pocket you can place a 32 oz Nalgene bottle and still have room inside. With Slumberjack Snare 2000 Internal Frame Pack unique pouches and straps, you can be sure that you will have enough room, and the inner pockets allow you to keep your important items nearby and safe. Inside there is a deep pouch for the possibility of a water pouch if you choose to have one, and it is made to last with durable materials. 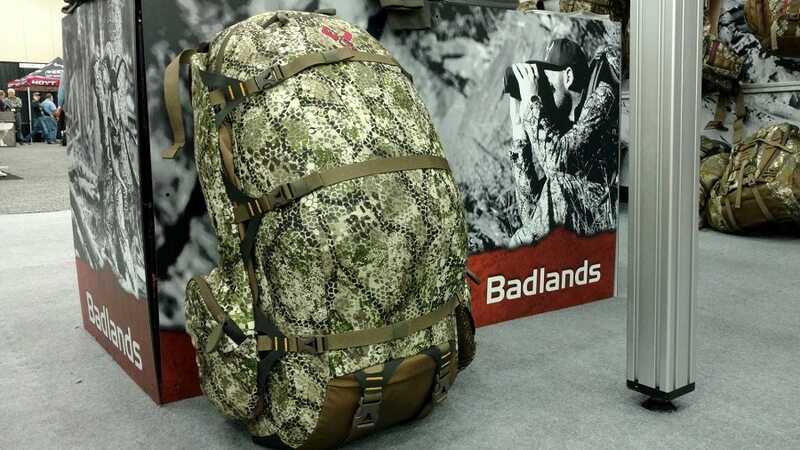 A few things noted about this pack is that the camouflage is a bit too bright, there is no waterproofing along the bottom, and that the opening to the bag itself could be a little bigger. All that being said, for its price people love the pack for its capacity to carry all they need and can take it on long hauls due to its internal frame. Specific Features: This Allen Canyon Daypack, 2150 cu. 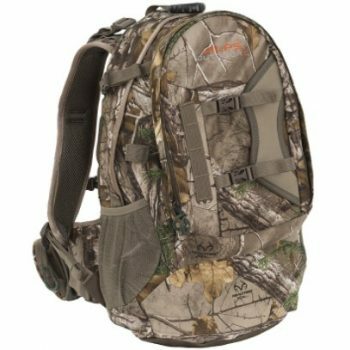 in., Realtree Xtra Camo comes equipped with the essentials including a much needed outside bow system that makes for easy carrying, dual water bottle holders, and internal organizational pockets. Some handy extras include zipper pulls and bright linings to help find your gear in lower light conditions. Description: This pack comes with everything you could possibly need already built in. It has a bow carrying system, bed roll straps so you can hunt in comfort and dual water bottle holders for extra hydration. The bright lining will help you grab your gear quietly and efficiently. Even the material itself is quiet, this daypack is made of brushed tricot fabric to make sure your bag is breathable and water resistant. Reviewers do notice that some of the materials used to make this pack are not of the best quality, specifically the seams and the buckles. That being said it is one of our cheaper packs that still carries quite a bit of weight. Specific Features: The Blind Hog can hold your bow and equipment with a built-in bow pocket, and pockets for Decoys, chairs, and other gear. This bag is a Blind pack, and will also fit your Hunting Blind. Description: This Beard Buster “Blind Hog” Ground Blind Pack System not only has plenty of room for your gear and weapon, it will also fit your ground blind and eliminate one additional heftier bag to bring along. It is both comfortable and keeps you well balanced as you trudge along. 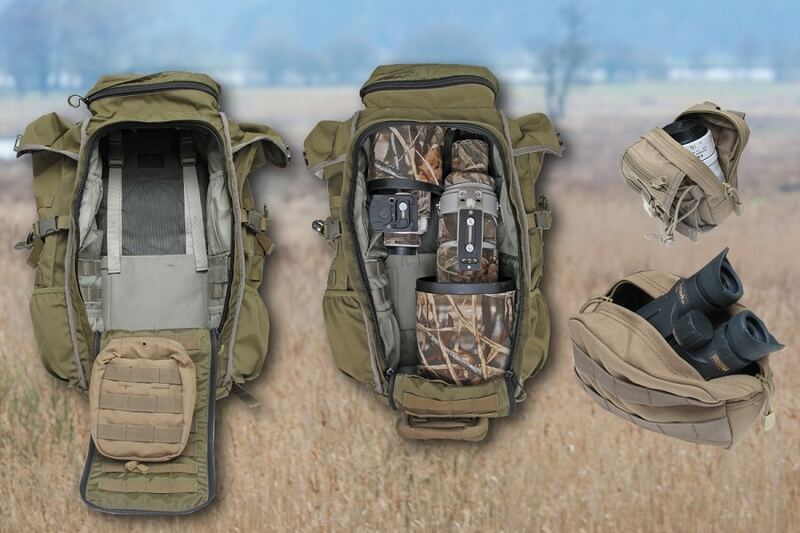 Instead of hauling along the bag that your ground blind came in, this genius bag will carry it and all your gear. The bag is durable, able to take a lot of weight and if anything breaks, this bag is under warranty. One thing to note is that there are plastic clips on the retaining straps, and while they appear to be a bit flimsy they have held up so far. That and the shoulder straps are not as adjustable as some wish they could be, the bag tends to drag low on some people. Lastly, the logo of the company is sewn on the back in a bright color, which for many isn’t a deal breaker but something hunters should be aware of. Specific Features: A very nice higher-end pack, the OutdoorZ Traverse comes with many features, including a bow pocket, adjustable torso straps, built in rain cover and an expandable pack section for hauling large loads. This bag is also equipped with a hydration port to accommodate a water bag, plus a spotting scope sleeve and the ability to add a clip-on holster. Description: The ALPS OutdoorZ Traverse EPS Hunting Pack offers quite a few features, but perhaps the best is that you are able to have a large range of adjustment in not only the straps but also in the compression. People love that they can bring it on backpacking trips and that the material is plenty durable to survive the backcountry. The suede material will keep your items safe and the built-in rain cover will keep them dry. There are two things to note about this backpack, one being that the shoulder straps have been reviewed as very uncomfortable and needing extra padding. If you find that you do not carry weight well on your shoulders, try this pack before you buy. The second is that if you have a long torso then the height adjustment mechanism may not be the solution that you were looking for. These are two specialty concerns though that may not affect your personal use of the otherwise nice pack. 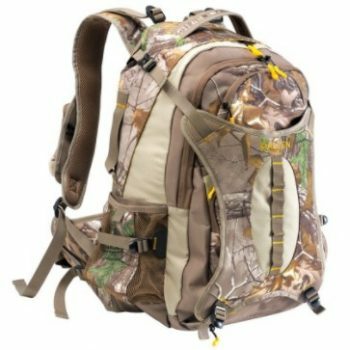 Specific Features: This ALPS OutdoorZ Pursuit Hunting Back Pack is versatile and able to help organize everything you might need on a hunting trip whilst remaining light. The Pursuit offers the essentials, such as a quiver holder and a bow pocket, as well as some handy extras like the ability to swap out your bow for a gun, and a built-in rain cover. Description: This well-rated backpack does quite a bit for you in the field, including plenty of space for your stuff and the ability to organize efficiently. Its material is ultra-quiet and comes with a rain cover so you can traverse in all seasons to bow hunt. Simply place in a hydration bladder, there is a pocket built in just for that, and you can have a hands-free silent trip. The bag stays in place on your back for a comfortable hike and has excellent padding. The only downside to this pack is that it is a bit heavier than some of its competitors, but for the price and comfortability, the extra weight seems worth it. 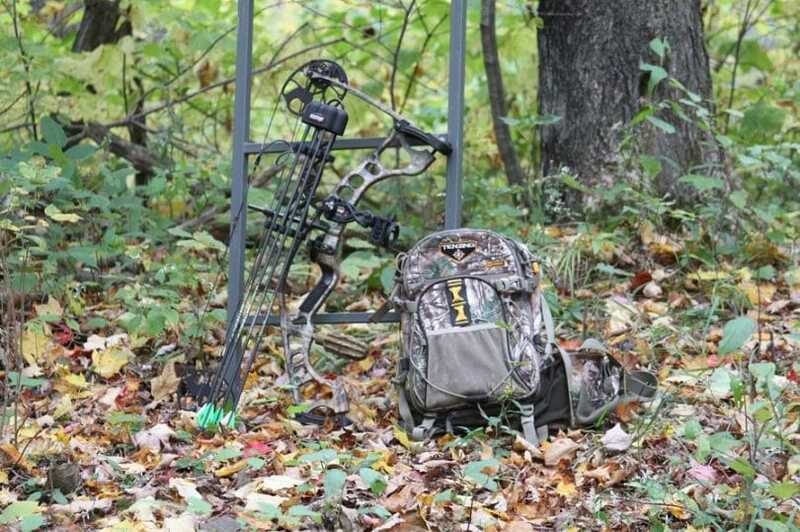 Taking a bag along on your bow hunting adventure can make or break a successful day out in the forest. You want to purchase a bag that gives you the versatility and comfortability necessary for a long day on the trail or crouching in your designated spot. 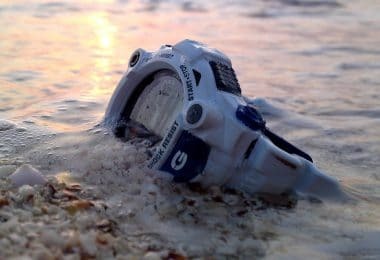 Think of all the gear you need to bring, the weather conditions you will be in, and then of course how well the bag fits to select the right one for you! Have we missed your favorite bow hunting backpack or should we consider another special feature? Let us know in the comments below!